A new microfluidic device developed by investigators at Massachusetts General Hospital (MGH) may help realize the potential of tumor-derived extracellular vesicles (EVs) – tiny lipid particles that carry molecules through the bloodstream – as biomarkers that could monitor a tumor's response to therapy and provide detailed information to guide treatment choice. In their report published earlier this year in Nature Communications, the team from the MGH Center for Engineering in Medicine (MGH-CEM) describes how EVs captured from serum or plasma samples of patients with the dangerous brain tumor glioblastoma multiforme (GBM) provided detailed, tumor-specific genetic and molecular information. "Glioblastoma is a highly fatal disease with few treatment options," says senior author Shannon Stott, PhD, of the MGH Cancer Center and the BioMEMS Resource Center in the MGH-CEM. "Due to the tumor's location, it has been challenging to get dynamic, real-time molecular information, which limits the ability to determine tumor progression and to match patients with the most promising new therapies. Our device's ability to sort tumor-specific EVs out from the billions of EVs carried through the bloodstream may lead to the development of much-needed diagnostic and monitoring tools for this and other hard-to-treat cancers." Previous technologies designed to isolate EVs were limited in their ability to distinguish tumor EVs from those carrying molecules from non-malignant cells. More specific approaches using tumor-specific antibodies were time-consuming and cumbersome or did not capture sufficient numbers of tumor-specific EVs from a sample. Other "liquid biopsy" technologies designed to capture tumor cells and molecules – such as several circulating tumor cell (CTC)-isolating devices developed by member of the MGH team – may be limited in their ability to monitor brain tumors throughout treatment. Since these potential biomarkers may not consistently pass through the blood brain barrier, their presence at the time a blood sample is drawn may be limited. Stott's team combined features of the CTC-detecting HB-Chip, which she helped to develop, with features specific to the capture of EVs. 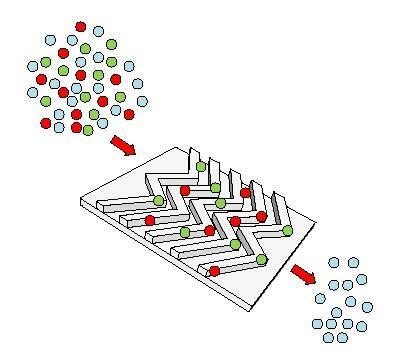 The surfaces through which a sample is passed are optimized to the physical properties of EVs – which are thousands of times smaller than cells – and contain a "cocktail" of antibodies against proteins highly expressed on GBM cells. The team also identified factors that increased the number of tumor-specific EVs captured from a sample and developed methods for releasing EVs from the device while preserving their contents for detailed analysis. Taking this approach, their device can isolate as few as 100 nanometer-sized vesicles in a one-microliter droplet of plasma. Stott notes that the EVHB-Chip was designed to be a low-cost, easy to use device with the hope of rapid translation to the clinic. "We are excited by this early-stage data, and we look forward to scaling the technology and increasing the number of patient samples analyzed. Specifically, we are interested in exploring how these vesicles change over time in response to treatment, and we see our blood-based assay as an ideal way to explore this in brain tumor patients," she says.